Heads Vs Breakers released one full length album called Apathy is the New Black. It's incredible. Is it in my top 25 albums ever...I think it could be. The last time I saw them was early 2000 and something. Can't wait for a reunion. I recently completed the collection. It took some serious detective work, a bunch of cash, and a whole lot of luck. I think this could be my most satisfying LP collection. It's finished, and I know it. That really feels good. don't know who this is, but that is pretty cool. 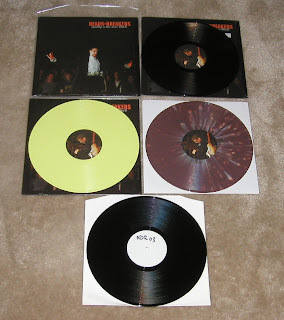 i played guitar in hvsb and have never even seen the color vinyl versions. from what i've been told, a lot of the copies made their way into the punkcore dumpster.